The K2 Black Panther is a Korean designed and produced main battle tank for the Republic of Korea armed forces. A long time in development, and hampered by engine and transmission production issues, the K2 entered service in 2014. Due to problems with the power plant, initial vehicles are powered by German built MTU-890 units until indigenous production could catch up. The vehicle is armed with a Rheinmetall 120 mm/L55 cannon which gives a higher muzzle velocity and armour penetration capability compared to the 120 mm cannon on the predecessor K1A1 tank. The vehicle has been exported to Turkey and is under consideration by Peru as their next main battle tank. The kit comes in a top opening box with some very nice box art showing the vehicle in question. Kit length is advertised as 308 mm and height is 97 mm. The box contains2 instruction manuals, full colour marking callout, 6 main sprues, individually moulded upper hull and upper and lower turret halves, a small PE fret, string for the tow cables, a simple decal sheet, polarized stickers for periscopes and 11 sprues for the individual link tracks. Overall moulding quality was very good with no flash or mis moulded parts anywhere in the kit. No sink marks or other defects were found on the plastic. PE was only for the turret basket floor mesh but was nice and thin and well detailed. Markings are not explicit as to units etc. however the decal sheet appears to have unit emblems for around 5 different units. The inclusion of individual link workable tracks is a very nice touch from Academy. These build up well and are fully workable when complete. These are the same tracks as used on the M1 Abrams, so it would be good to see Academy release these as a set on their own for use on other M1 kits. The inclusion of string for the tow cables is a bit disappointing, but this is easily replaceable. The instructions where easy to follow and clearly laid out. There was no mistakes noticed in the instructions. Also included is a full colour callout which shows both the decal placement and colours/camo pattern. Paint manufacturers include Humbrol, Mr. Hobby, Lifecolor, Testors/Model Master, Revell and Vallejo. Assembly starts with the turret and is covered in Steps 1-10. Whilst this is quite a number of steps, each covers the addition of just a few parts and therefore makes the assembly fast and straightforward. The kit includes the option on whether to add ERA blocks to the turret and hull. I chose to add these to the review kit. All periscopes are solid plastic with the glass represented by the included polarized stickers. These are a touch tricky to get into place, and personally I would prefer clear plastic parts here. Or at least the option. The gun barrel is slide moulded and is built up of 3 parts. The cupola and co-ax MG barrels are also slide moulded. Step 11 builds up the lower hull tub. This is comprised of a base plate and two sides, with two internal bracing walls, which is a nice touch and adds some stability to the lower hull. Step 14 deals with the construction of the rear plate. This is very similar in look to the rear plate of the M1 Abrams, as with the K1A1 the M1 influence is quite clear in aspects of the K2. Road wheel and suspension construction is covered in Steps 16-21. The kit does include poly caps, although they feel more like plastic than the obviously rubber vinyl ones found in Tamiya kits. They do the job well of allowing easy installation and removal of the wheels. After Step 16 the construction moves from Manual 1 to Manual 2. I don’t quite understand why there are two manuals in this kit, however its not a deal breaker in anyway. Upper hull construction is covered in Steps 22-24. There are only a relatively few parts to be added to the upper hull which makes these steps nice and quick. The drivers vision blocks are solid plastic with the lenses represented by the included polarized stickers. Step 25 is the track construction. Each link is a single piece with two optional rubber pads. Most modern tanks have these and so I added them as per the instructions. Two types of guide horn are included, the enclosed one is correct for this kit, I believe the “open” type is used on the M1. The central guide horns click together each link, with these secured by push on end connectors, which leaves the track workable. The instructions call for 78 links per side, but I found 75 to be enough. Although one side needed 76 to not put too much tension on the final join. The side skirts are built up in Steps 26-28 and again have the option for additional ERA or not. Step 29 covers the addition of the turret to the hull and the installation of the wing mirrors. The final pages of Manual 2 has the sprue map, a bit of a diversion from most kit manufacturers who would locate this at the start of the instruction booklets. A nicely detailed, modern tooled kit, which builds up very much like a Tamiya kit. Assembly was easy and quick and resulted in highly detailed kit. This kit is a vast improvement over Academy’s offering of the K1A1 kit, which is much simpler in its design and has softer details, vinyl tracks and other signs of age. A recommended build for those who have an interest in modern MBTs. Highs: Excellent surface details and parts fit. Low parts count means a quick build. Very Tamiya-like in construction. Cement-free workable tracks. Lows: Two booklets for instructions. Mirrored stickers for periscope lenses, clear plastic parts would be preferable. 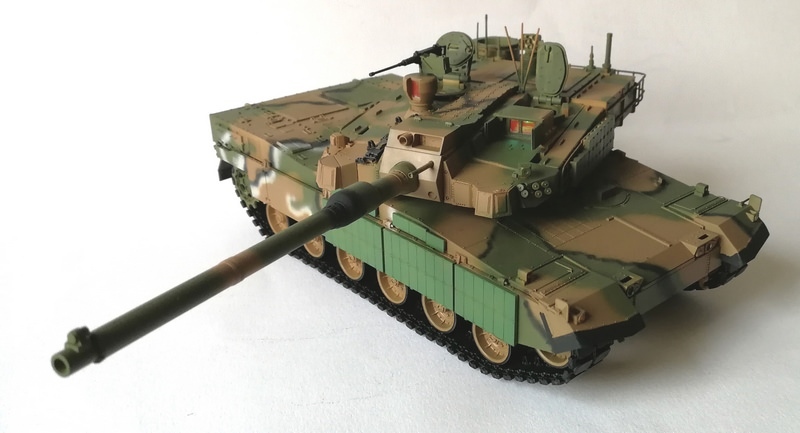 Verdict: A brilliantly detailed model of this latest MBT from South Korea. The small amount of PE will be to some modellers liking, but others may want more. The cement-free, workable track links are a nice addition. Construction is very quick and straightforward. Copyright ©2019 text by Gavin Turner [ GAV0909 ]. All rights reserved. Great review, thanks for the information. The tracks are made by DefModels and can be found in the newest release of M1A2 by Academy. They are available on line on Def's website. or any hobby shop that carries Def products. Thanks for the review Gavin, I will be getting this one, and it looks like it will be a fun build! Great work Grzegorz, very nice build, with a recommendation like that, I may have to build this kit sooner than expected! A great review. Many thanks. There is also a metal barrel from Def models for this kit. No PE parts needed, but if somebody would like to add some upgrade set, there is one from MK1 DESIGN LINK There is one more upgrade set from Voyager, but i think, that would be waste of money.